Ten-man Ratho Athletic defied their league standing in LEAFA as they knocked out top Premier League club Craigshill Thistle 6-2 in a Logan Cup third round shock. Intermediate outfit Ratho didn’t let the occasion get to them as they raced into a surprise early 2-0 lead. Thomas Robertson put them ahead after he finished well following a perfect through ball from Baillie McLean, before Dean Crane found the net soon after with a deflected effort after Robertson had set him up. The visitors were cruising at this stage, but they suffered a blow late in the opening period when Denis Staskewitsch was sent off after being shown a second yellow card. Ratho didn’t let that deter them, however, and went 3-0 ahead after the break when Crane secured his second of the afternoon after a fine ball in from Chris Hendrie. They continued to impress with ten men and Robertson assisted once more, playing in Scott Aitken who finished excellently. Goalkeeper Mateusz Wronski made a penalty save to preserve their advantage, before further goals from Hendrie – who struck from 35 yards out – and Craig Smith made it six. 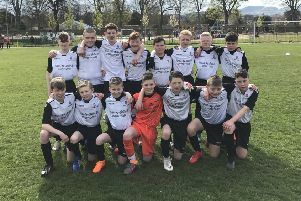 Craigshill netted two consolation goals late on, but by then Ratho were well on their way to the quarter finals after a stunning performance. Corstophine Dynamo edged out Queensferry Athletic 3-2 in the first round of the Victory Cup away from home. Matthew McAlister put Dynamo ahead in the 22nd minute with a fine finish into the bottom corner and he was soon celebrating again when he made it two after a superb assist from Mitch Tanner – his team-mate knocking the ball around a home defender before collecting it once more and passing into McAlister to net. Two goals from Queensferry levelled the tie midway through the second half, but Dynamo bounced back to get a winner, with McAlister this time supplying captain Sean Moran who sent a diving header into the goal. Lauriston Thistle hit ten goals in a 10-1 Ronnie Travers Cup demolition job of Leith United. Ryan Robertson struck a hat-trick for the hosts and Stevie Clee notched a double, with further goals from Dale Paterson, Paul Dickson, Matty Hunter, Ryan Currie and Ryan Raeburn as Ryan Dinse got his new role as manager off to the perfect start.